The first half started off so promising! I loved Karou, she was smart, snarky, funny, slightly mysterious, everything I love in a protagonist. The Prague setting was incredible, especially Karou and her friend’s favourite restaurant Poison Kitchen, which I wish was a real place because it sounded so cool. There was humour, there was mystery with Brimstone and his chimaera and the whole teeth thing and getting to see Karou go to different places through the doors was pretty awesome. So all in all a great start. The writing was also really pretty without being overly purple. I was totally invested in this world of Prague and teeth and wishes (especially the whole wish thing that was really great), so even though the plot was moving slowly, I didn’t mind. There was also a whole mystery with black handprints on the doors being introduced which I was intrigued by. And we had Karou’s friend Zuzana who was just such a cute, small, snarky badass, and was a great friend to Karou despite her disappearing off all the time. All in all it was shaping up to be a great book. Then came Akiva. And everything I loved about the book in the first half was gone. Instead of focusing on Karou and her Chimaera and Prague and Zuze, it became all about Akiva, who had as much personality as a damp squid and his lurrrrrrrrrrve for Karou, despite having only just met her! (Can we be done with the insta love already?) He was just such a cliche, perfectly handsome, mysterious but incredibly dull, like most YA love interests. We spent chapter after chapter with Akiva and Karou talking about how much they loved each other and all that fluffy stuff and I was like, where have my cool chimaera gone? Where are the doors and the teeth and the wishes and everything I loved about the first half? Suddenly the book had done a 180 and become another cliche YA romance. The plot was also incredibly slow moving, when it was there at all. It felt like it couldn’t decide what it wanted to be, was it about Karou’s chimaera family and Brimstone and the teeth and wishes like in the first half? Or about Karou and Akiva’s love story? Or about the war between the angels and chimaera? It felt like the book kept chopping and changing and there was no real coherency between the three parts. 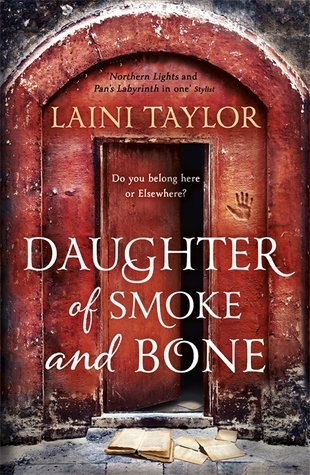 I felt like Taylor maybe tried to put too much into this book and it didn’t really work, it would have worked better if she had stuck with perhaps one or two main plot threads, rather than over complicating it. The main mysteries seem to revolve around who Karou really is (it’s established early on that she’s not quite what she seems) and what Brimstone does with the teeth, both questions that aren’t answered until the last third, meanwhile you have to deal with Karou and Akiva being all moony with each other despite barely knowing each other. I loved Brimstone and would have liked there to be a little more focus on him really as I found his teeth collecting and wishes far more interesting that Karou and Akiva’s “love story”. I did like the world building and the mythology of the Chimaera/Seraph world, Eretz, but I think it suffered a little by essentially all being thrown into the third half, it would have been better if it had been spread out more throughout the story. Still it’s an interesting world that Taylor has created and I’d be intrigued to learn more in the next book. I liked that the book had chapter titles, it’s such a small thing but it pleases me when authors do it, simply numbered chapters are kind of boring! The part with Zuze’s marionette show was so cool, I wish people did things like that in real life, it would be awesome to see. I would have loved to have seen more of her and Mik, they seemed like they made a cute couple and I was actually more invested in their relationship than Karou and Akiva’s! The whole flashback sequence in part three was very clunky. I understand why it was necessary in the overarching plot of the story, but I feel like the flashbacks could have been weaved into the story rather than having their own separate part, again it felt very disjointed. The writing also ended up becoming increasingly more and more purple as the book went on, at least for me. The only thing I liked about the third part was the masquerade bit as I am a sucker for a good masquerade! The chapter lengths were mostly good, although they were sometimes a little long in the second half especially when there wasn’t much happening. The end was incredibly anticlimactic, we had just been through this hundred page detour in order to find out who Karou was, we get this massive bit of information and then it just cuts off? I mean I get that you’ve got to get your readers interesting in reading a second book, but this felt like a lazy cliffhanger rather than a good one. Overall, this book started decently enough, with an intriguing mystery but deteriorated in favour of a sub standard romance throughout the rest of the book. I’ll still read the second one as I’m interested in seeing what happened next and I did like the world that the author created, but I hope that romance is less of a focus in the next one! My next review will be of the second book in Samantha Shannon’s Bone Season series, The Mime Order.